I’ve had this big news for awhile, but I have been holding it back until it was officially announced. We are heading to Vail Valley, Colorado to play at The Snow Ball. It’s the festival’s first year, and it’s quickly shaping up to be a major contender in the festival circuit. Nicknamed “Snowchella,” I can really see this festival taking off and just becoming more and more of a musical behemoth. I can’t wait to just go there. I’ve never been to Colorado or a festival, so it’s going to be a slew of new experiences for me. The story of how we got involved with The Snowball is this: I found out about it sometime around when it was announced. Then, I posted on something on facebook basically saying, “how do I go to this?” It was really just a way to say that this event seemed like it was going to be really rad, and I wanted to go. There was no serious intention of getting there because I really lack the funds. However, through a couple of friends, I was set up with a solid contact for the event. He has been super helpful in communicating with us, and has been helping push for us to come to Colorado. 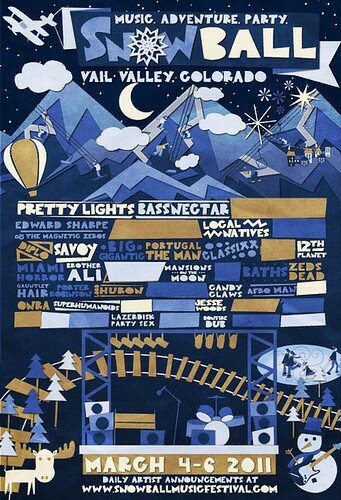 Long story short, we ended up working something out, and now we get to perform at this awesome festival in Colorado. He has helped us a ton, and I’m so pumped to have this opportunity and friends that are willing to help us out. It’s really the best. The Snowball is an appropriate title for our first festival as LDPS, too. We are traveling west to Colorado with the intention of making as many stops as possible in cities and towns that want us there. We are working on solidifying gigs in the days leading up to the Snowball, and saving our big performance for the festival stage. After the dust settles from the snowball, we have plans to make a trip down south to Florida. I can’t give many specifics because we don’t have anything in stone, but the plan is to remain in Florida for two weeks. After Florida, we are heading back up the east coast with the intention of playing at as many colleges as we possibly can, then we will end up back in the Northeast in mid-April. What started as a shot in the dark on facebook has led to a month-and-a-half long nation-wide tour. I really couldn’t be happier. The official Snowball Website is here: www.snowballmusicfestival.com. They are announcing new artists daily, and tickets are available on that site. Thanks to everyone at the snowball for letting us play, and a huge thank you to the friends that have helped us get a spot at the show.